The film we have all just watched presents a very different vision of the women’s suffrage movement than one that I, at least, was taught in school. As a teenager I was always told that Suffragettes were nice (if slightly bonkers) posh ladies in impressive hats to whom we had to feel extremely grateful for getting us the vote. The film Suffragette therefore does an excellent job at exploding some of the myths that continue to pervade official histories of ‘Votes for Women’. The Women’s Social and Political Union (WSPU) did indeed recruit many wealthy women, and was led by the middle-class and highly-educated Pankhurst family. But (as feminist historians have been arguing for decades) support for women’s enfranchisement was also popular among working-class women – many of whom joined the fight, despite the difficulties of combining this with jobs in factories and their responsibilities as housewives and mothers. So the characters Maud Watts (Carey Mulligan) and Violet Miller (Anne-Marie Duff) make me think about real-life suffragette Hannah Mitchell who worked as a domestic servant and a seamstress, and even after marrying had to take on dressmaking to supplement her husband’s meagre wages. 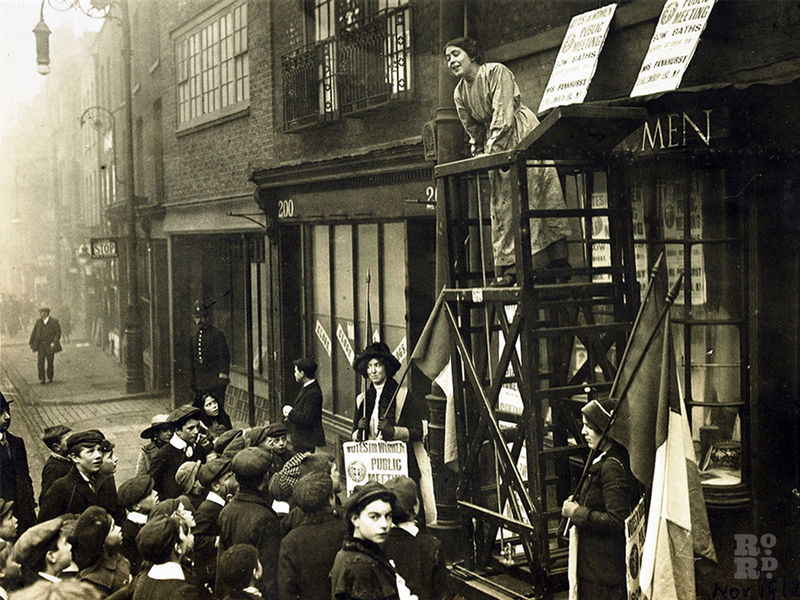 On top of all this, she travelled regularly from the north of England to London to protest outside Parliament, and organised local activities for the WSPU and the Women’s Freedom League – a level of activity and overwork that eventually resulted in a nervous breakdown. Hannah Mitchell never regretted or gave up her political activism, but she did remark in her autobiography how working-class suffragettes such as herself had to campaign ‘with one hand tied behind us’. Working-class suffragettes were also treated much more harshly by the state, especially when they were imprisoned and went on hunger strike. The film hints at this, when we see the upper-class Alice (played by Romola Garai) quickly bailed out of gaol by her wealthy husband, while Maud Watts and Violet Miller are left to serve their time. In fact, the suffrage movement at the time were aware of this disparity and injustice which was highlighted by Lady Constance Lytton, who, due to having a weak heart, was treated more gently by prison guards and prison doctors aware that they had an aristocratic suffragette in their care. On one occasion, however, Constance Lytton disguised herself as Jane Warton – an “ugly” working-class seamstress. Arrested as usual for acts of militancy, “Jane Warton” declared her heart condition to prison officials, but received none of the special treatment she had known as Lady Constance instead she was brutally beaten and subjected to the kind of force-feeding we saw in the film. Her account of this became a cause célèbre in the suffrage movement, which in spite of many flaws was not wholly insensitive to the different class positions of its supporters. One important aspect of the relationship between gender and class in the suffrage movement – one which is missed out altogether in the film – is the relationship between feminist campaigns and militant trade unionists who combined support for working-class struggle with women’s emancipation. In the film, when Maud Watts goes to prison for the Cause, she not only infuriates her husband who eventually throws her out on the street and takes her child from her, she is also turned upon by the whole of her working-class community. This is not necessarily historically inaccurate, but it is a slightly odd decision by the director and writer who have set the film around here in the East End of London, which was where the socialist feminist Sylvia Pankhurst and the radical Labour MP George Lansbury had an extremely strong base of support among working-class people of all genders. It is just as historically likely that Maud’s husband Sonny (Ben Wishaw) – and certainly some of Maud’s neighbours – would have been supportive and proud of Maud’s commitment to votes for women. And I am interested to hear in a minute, why other people think that this aspect of suffrage history might have been ignored in the film. Another important critique made of this film more widely in the last week or so, centres around its race politics. Many of you will no doubt have seen the photo shoot that appeared in Time Out London, in which the stars of the film appeared in T-shirts bearing the slogan ‘I’d rather be a rebel than a slave’. Black feminist Kirsten West Savali, among others, has pointed to the racist origins and contemporary resonances of the slogan – which both makes a shallow and opportunistic comparison between the oppression of (white) women and the enslavement of people of colour, and also ignores a history of Black women whose enslavement certainly did not always prevent them from rebelling against both the patriarchal and racist system that oppressed them. Debates around this slogan and the T-shirts, have generated more general criticism of the film Suffragette for focusing solely on white women – leading some people to dismiss it as a history of ‘white feminism’ for ‘white feminists’. I been thinking a lot about these critiques over the last week, and what my responsibilities are as both a feminist (who is indeed white) and as a historian who researches this period. I think we certainly do need to consider the bigger picture, in which a film like Suffragette starring young, attractive and famous white women has received an enormous amount of both mainstream and left-wing publicity in a way that, perhaps, Selma (a similarly panoramic feature film about the Black civil rights movement in the United States) certainly did not. I am more cautious, however, about the political utility of labelling, and perhaps dismissing, both the film and the period of history it depicts as ‘white feminism’. This is certainly not to deny the racism that permeated much – indeed probably the majority – of the British women’s movement at the time the film is set. Racism in the British movement was somewhat different from that of the North American suffrage movement, in that, on the whole, it was directed not at a Black population living in Britain – which in 1912 was still very small in number – but instead played out in the context of the British Empire. Many white British women therefore argued for political rights for themselves, on the grounds that this would better enable them to play their part in Empire and/or ‘rescue’ their ‘little sisters’ in the colonised territories from oppression at the hands of more ‘backward’ societies. This Imperial feminism has weighed heavy on successive waves of the British women’s movement, and continues, I think, to shape much of the present-day political landscape. Yet there was also space in Britain for currents of anti-imperialist and anti-racist feminism to develop – exemplified by women such as Harriet Law, Annie Besant and Catherine Impey, who were also active supporters of women’s suffrage. 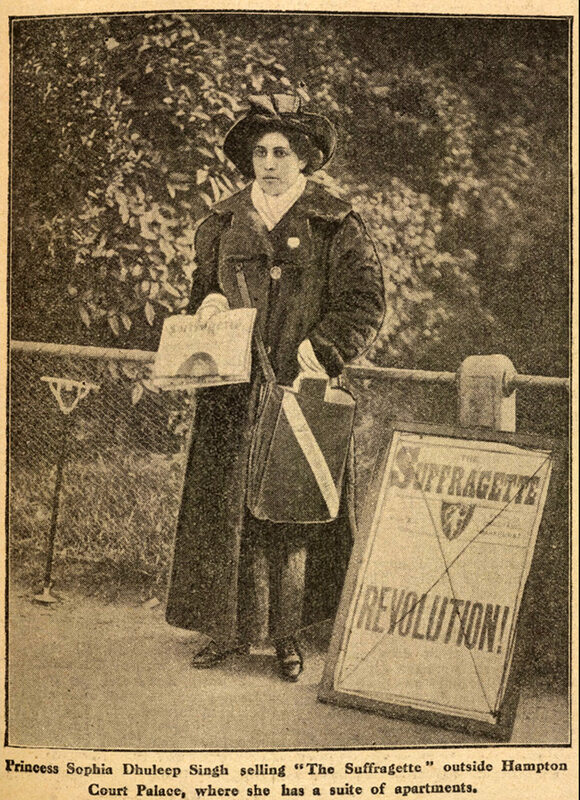 There was also a group of upper-class Indian feminists in Britain, including Princess Sophia Duleep Singh, who threw themselves into the campaign for the vote. This alternative tradition of feminist politics was certainly a minority one, but it does complicate any attempts to dismiss the history of this movement as ‘white feminism’ concerned solely with the rights of white women and excluding people of colour. I have been very excited to see the extent and intensity with which this period of history is currently being debated by feminist activists today. As a historian who is also involved in feminist activism, I believe that histories can be useful for present-day struggles. They are also open to appropriation and abuse, and can be used to quite radically different political ends. The photo shoot of Suffragette actresses wearing ‘rebel-slaves’ T-shirts is one example, but Sisters’ Uncut’s protest at its premiere, raising awareness about cuts to domestic violence services, is another. Part of the reason that I’ve been a bit geeky here in wanting to talk in more detail and with more accuracy about both the class and race politics of the British women’s suffrage movement, is because I think that knowing our history helps us to make better use of it in the present. However, possibly one of the most dangerous ways in which the history of a movement like the fight for votes for women can be used, is to see it as a museum piece – as a quaint example of feminist activism from a time that is well and truly over, to tell women today that the struggle against gender injustice belongs to the past. This is obviously not the case – there is still much to fight for in the present day, with new waves of feminism continuing to emerge. And on this note I want to hand over to Alice Robson who is a member of an activist group that I’m also involved in – called Feminist Fightback. Click here for Alice Robson’s speech at the film screening. Click here for more details about the film screening.